Bill Maher: If it’s one thing I hate more than prophesy, its self-fulfilling prophecy. Comedian, Bill Maher, is not happy. In fact, he’s downright fed up. 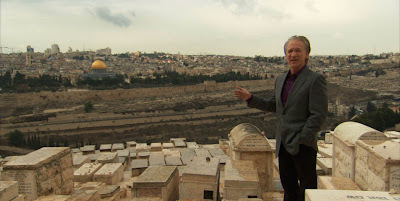 And if you don’t want to see Bill Maher pissed, well then you don’t want to see his first documentary film, RELIGULOUS. If a little anger doesn’t bother you, then you’re actually in for a pretty funny, fairly assertive and unfortunately, somewhat uneven time. You can’t blame Maher though. He’s just been living in the twilight zone for too long. It just so happens that his particular twilight zone is Earth and he can’t really get away from that, now can he? Maher has been racking his brain for years now, trying to understand how so many intelligent people are still subscribing to organized religion when all he can see is how the entire concept has stumped the progression of the human race, brought about global unrest and promoted hatred and ignorance. Sure it brings a great deal of people intense solace about where their soul will go in the afterlife but he cannot resolve that with the painfully obvious mythological nature of the teachings. He urges people to take an honest look at their beliefs, to face the reality of stories about men living in giant whales for days at a time. All he can do in the meantime though is laugh. And laugh he does, right in the faces of the people he is interviewing at times. Yes, it must be hard to sit across the table from an “ex-gay” trying to convince him that homosexuality doesn’t truly exist and that prayer can help you find the confidence you need to be a solid heterosexual. Yes, it must be a struggle to keep a straight face when you take a tour through an animatronics park dedicated to teaching children about how both man and dinosaur co-existed in order to justify the creationist theory. And I doubt very much I would be able to sit across from a television evangelist justifying his $2000 suit by claiming Jesus himself wore only the finest linen robes without losing it. Still, restraint is a virtue. I think Jesus might have said that but I’m paraphrasing. Maher has none. So convinced is he in his rational that he can barely contain himself in interviews, which makes him come off somewhat indignant and pompous. Of course, I’m laughing at these people right alongside him but I’m not sitting two feet away from them so it’s totally acceptable. 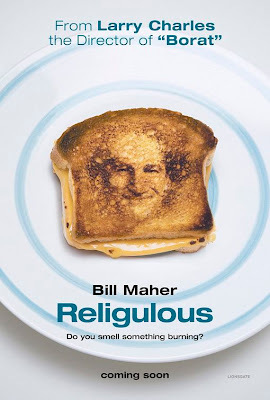 Laughter is abundant in RELIGULOUS but it does occasionally take away from the grander, intelligent debate that is raised from Maher’s questioning. RELIGULOUS is a perfect example of preaching to the converted. Religious fanatics are definitely not going to line up for tickets to this show. That’s fine; these are not the people Maher is trying to reach. As far as he is concerned, they are far beyond reach at this point in the game. Still, I’m not sure that fans of Maher’s previous work who might come out to catch this and who just might be also religious folks will hear his point. Given the choice between Bill Maher and the God they have been worshipping since birth is not much of a contest. Sorry, Bill. Maher doesn’t seem so concerned with these people either though. Maher is trying to speak to all the people out there who are sitting atop that proverbial fence. The agnostics of the world and those debating the merits of organized religion and whether it does service to the God they know to be out there, these are the people Maher hopes will hear his prayer. And once they do hear it, he wants them to go forth and preach the non-word to anyone who will listen. I hope this doesn’t sound pessimistic to Maher but I have little faith that his argument will topple centuries of ritualistic worship. This is especially the case when Larry Charles’s directorial decision to cut away to countless other films as supposed comic accents ultimately undermines the case by interrupting the points in progress. Still, Bill Maher is just one man and I commend him for speaking his mind when his opinion is so clearly in the minority. Hopefully, one day, people will be able to see through his somewhat bitter condescension to see that he isn’t merely mocking their beliefs. No, Bill Maher just wants the world to be a better place … y’know, like it was when Jesus was here and the world was still flat.